View of Oroville Dam's main spillway (center) and emergency spillway (top), February 11, 2017. The large gully to the right of the main spillway was caused by water flowing through its damaged concrete surface. In February 2017, Oroville Dam's main and emergency spillways were damaged, prompting the evacuation of more than 180,000 people living downstream along the Feather River and the relocation of a fish hatchery. Heavy rainfall during the 2017 California floods damaged the main spillway on February 7, so the California Department of Water Resources stopped the spillway flow to assess the damage and contemplate its next steps. The rain eventually raised the lake level until it flowed over the emergency spillway, even after the damaged main spillway was reopened. As water flowed over the emergency spillway, headward erosion threatened to undermine and collapse the concrete weir, which could have sent a 30-foot (10 m) wall of water into the Feather River below and flooded communities downstream. No collapse occurred, but the water further damaged the main spillway and eroded the bare slope of the emergency spillway. 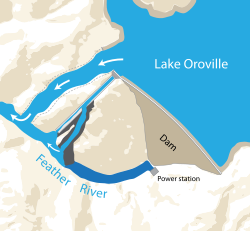 Oroville Dam, an important part of the California State Water Project, is an earthen embankment dam on the Feather River, east of the city of Oroville in Northern California. The dam is used for flood control, water storage, hydroelectric power generation, and water quality improvement in the Sacramento–San Joaquin River Delta. :A1, A5 Completed in 1968, it is the tallest earthen dam in the United States, at 770 feet (230 m). :A1, A5–A6 It impounds Lake Oroville, the second largest man-made lake in the state of California, capable of storing more than 3.5 million acre-feet (4.4 km3). The adjacent Edward Hyatt Powerplant has six power-generating turbines with a total installed capacity of 819 megawatts (MW) of electricity. For flood control purposes, some space in Oroville Reservoir has to be kept dry to capture floodwaters, a practice that has caused controversy at other dams of California over the amounts of water wasted. 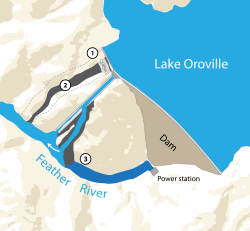 Dam operators were required to discharge water based on charts contained in the Oroville Dam Reservoir Regulation Manual, a flood-control manual developed by the U.S. Army Corps of Engineers. :6–9 At the time of the incident, the Oroville Dam Reservoir Regulation Manual had last been updated in 1970 and the discharge charts were based on climatological data and runoff projections that did not account for climate change or significant floods in 1986 and 1997. It is not yet clear if the outdated manual was a significant factor in the February 2017 crisis. Through the hydro-electric generators, which have a combined maximum flow rate of 16,950 cu ft/s (480 m3/s). According to FERC engineering guidelines, "Emergency spillways may be used to obtain a high degree of hydrologic safety with minimal additional cost. Because of their infrequent use it is acceptable for them to sustain significant damage when used and they may be designed with lower structural standards than used for auxiliary spillways. ":18–19 The FERC determined that the emergency spillway structure was compliant with its engineering standards and that the erosion concerns raised by the environmental advocacy groups were overblown. The commission also determined that the emergency spillway could handle 300,000 cu ft/s (8,500 m3/s) of discharge and renewed the dam's license without requiring the concrete lining of the emergency spillway, estimated to cost over $100 million. A 2018 analysis by the Association of State Dam Safety Officials found that the commission relied on original geology reports from the 1960s which stated that the hillside below the emergency spillway was bedrock; in fact, it was actually weathered rock subject to deep erosion if the spillway were to be put into use. Prior to February 2017, the main spillway had been last inspected in August 2016. During that inspection, the spillway was visually inspected without inspectors entering the spillway chute. Inspectors entered the spillway chute for inspections in 2014 and 2015 without finding any concerns. Cracks in the concrete spillway chute were repaired in 2009 and 2013. 1. The lake level is controlled using the main spillway gate, which releases water down the concrete spillway to get to the river below. 2. The emergency spillway, which has a 30 ft (9 m) high concrete wall at the top of a hill, is unused. Despite concerns that the emergency spillway is vulnerable to erosion, a $100 million request by community groups to upgrade it to a concrete-lined auxiliary spillway is rejected by the federal regulators. Craters appear in the main spillway. To avoid increasing the damage to the spillway, water releases are slowed allowing the lake to rise. Water flows over the emergency spillway causing erosion and damage. This is by design and prevents water going over the top of the main dam. However the ground erodes faster than expected. Rocks and concrete (1) are placed under the emergency spillway weir to repair erosion damage (2). The release of water into the main spillway is increased, to lower the lake in preparation for more rain. This erodes the adjacent hillside considerably, generating a debris dam (3) that blocks the river and forces the closure of the hydroelectric plant. While the main 770 ft (230 m) dam is not threatened, if the erosion on either spillway reaches the top, it would cause the weir or gate (respectively) to collapse, causing a large uncontrolled water release and life-threatening floods. In early February 2017, high inflows to Lake Oroville caused dam operators to start using the concrete main spillway to control the lake level. Between February 6–10, 2017, 12.8 in (330 mm) of rain fell on the Feather River Basin. Inflow of water into Lake Oroville rose from 30,000 cu ft/s (850 m3/s) on February 6 to over 130,000 cu ft/s (3,700 m3/s) at mid-day on February 7, before subsiding to about 75,000 cu ft/s (2,100 m3/s) the following day. Dam operators began increasing the flow down the main spillway to 54,500 cu ft/s (1,540 m3/s) on February 7 but soon noticed an unusual flow pattern. The flow of water down the spillway was stopped for investigation, revealing a crater about halfway down the spillway where the concrete lining was eroded through and water was escaping the concrete chute. The DWR consulted with FERC and other dam safety agencies about the issue and prepared for the possibility of using the emergency spillway. During two test flows down the spillway on February 8–9, the length of the crater increased from 250 ft (76 m) to 300 ft (91 m). Meanwhile, the level of Lake Oroville was rising as inflow into Lake Oroville skyrocketed from about 130,000 cu ft/s (3,700 m3/s) on February 7 to a peak of 190,435 cu ft/s (5,395 m3/s) late on February 9. 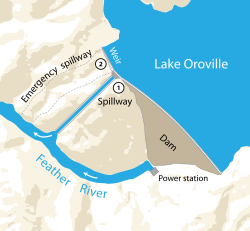 The DWR was then confronted with two choices: use the main spillway, knowing it would likely be further damaged, or allow Lake Oroville to rise until it overtopped the emergency spillway. Damage to the main spillway began as a crater in the middle (center) and eventually resulted in a separate channel eroded to the side (right). At left, the main spillway is shown in March 2011 while at its maximum discharge rate. On February 9, the main spillway was reopened. DWR hoped that using the damaged spillway with a limited flow could drain the lake enough to avoid use of the emergency spillway, which would potentially damage powerlines servicing the hydroelectric plant. The following day, discharge on the main spillway was reduced from 65,000 cu ft/s (1,800 m3/s) to 55,000 cu ft/s (1,600 m3/s), but this flow was not enough to prevent the lake from rising. On February 11, the lake level reached 901 ft (275 m) above mean sea level and water began flowing—as designed—over the concrete weir along the top of the emergency spillway, cascading onto the emergency spillway for the first time in the dam's history. As the lake level rose, measures were taken to prepare the emergency spillway for use. On February 10, 2017, workers began clear-cutting trees on the hillside below the emergency spillway. Shortly after 8:00 am on February 11, 2017, the emergency spillway began carrying water for the first time since the dam's construction in 1968. 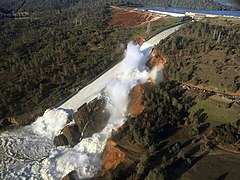 Because the spillway was a separate structure from the dam, officials stated that there was no danger of the main embankment being breached, and evacuation of Oroville was not considered at that time, as officials stated that there was no threat to public safety. The uncontrolled flow over the weir topped out at 12,600 cu ft/s (360 m3/s). Erosion at the base of the weir—which was expected—progressed much faster than anticipated. 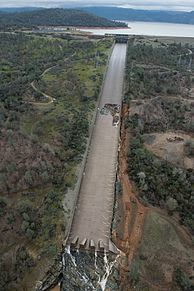 The headward erosion of the emergency spillway threatened to undermine and collapse the concrete weir, in which case a 30-foot (9 m) wall of water would be sent into the Feather River below and flood communities downstream. Fearing a collapse, the Butte County Sheriff's Office issued an evacuation order of the Oroville area. To ease pressure on the emergency spillway and prevent a possible collapse of the weir, the DWR nearly doubled the discharge volume of the main spillway from 55,000 cu ft/s (1,600 m3/s) to 100,000 cu ft/s (2,800 m3/s). Several hours later, water stopped flowing over the weir onto the emergency spillway and officials began assessing the state of the emergency spillway. On February 12, 2017, evacuation was ordered for those in low-lying areas along the Feather River Basin in Butte, Yuba and Sutter counties, because of an anticipated failure of the emergency spillway. Specifically, erosion on the hillside was growing uphill toward the concrete lip of the emergency spillway, leading to the fear that it would collapse. 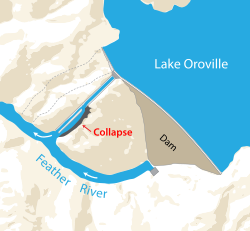 A failure of the concrete top of the spillway would allow up to 30 feet (9 m) vertical of Lake Oroville through the gap in an uncontrolled deluge. The flow over the main spillway was increased to 100,000 cu ft/s (2,800 m3/s) to try to slow the erosion of the emergency spillway. By 9 p.m. on the evening of February 12, the increased flow had successfully lowered the water level to below the emergency spillway top, causing the emergency spillway to stop overflowing.The stop in water flow allowed the erosion there to be hastily inspected and stabilized with boulders. Engineers worried that the damage would be transferred to the main spillway, not only making future repairs more expensive, but also that the damage to the main spillway could grow uphill to the point that it endangered the main spillway gates, leaving no safe way to release water. The extent of such damage was unknown; it was expected to be assessed on the morning of February 13. On February 13 helicopters began to drop sandbags and large rocks in the area of the now-dry emergency spillway, in order to protect the base from erosion. By February 13, 188,000 people in the vicinity were reported evacuated. About 23,000 National Guardsmen were ordered to be ready for "immediate deployment if the dam spillway should fail" to help with evacuation and relief efforts. On February 14, at 2:45PM local time, the evacuation order above was reduced to an evacuation watch by emergency management officials and the State of California Department of Water Resources, and people were allowed to return to the evacuated areas. The immediate harm from the damage is limited to the area downstream of the breach, eroding the hillside to form a canyon. However, a major danger is that the spillway can erode back up toward the gate because of being undercut by the water falling into the crater. Eventually, this would threaten the spillway gate, in close proximity to the actual abutment of the dam. 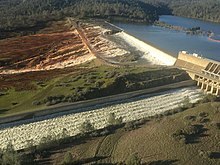 About 150,000 cubic yards (110,000 m3) of erosion debris clogged the channel of the Feather River below the dam, preventing release of water from the hydroelectric plant, thus reducing the overall capacity of the dam to release water. Debris was carried downstream and caused damage to the Feather River Fish Hatchery due to high turbidity. State workers began evacuating fish and eggs from the hatchery in an attempt to mitigate the damage and evacuated over nine million fish downstream to a satellite hatchery adjacent to Thermalito Afterbay. On February 27, the flow to the spillway was temporarily shut off, allowing crews to begin removing debris in the river in preparation to restart the power plant. After the spillway was shut off, it appeared that headward erosion along the spillway channel had mostly stabilized, reducing the immediate threat of a gate failure and uncontrolled water release. The bedrock under the upper half of the spillway appears to be much stronger than the rock which was washed out under the midsection of the spillway. In addition, the force of the falling water had excavated the original crater into a deep plunge pool which acts as a hydraulic cushion, dissipating much of the energy that otherwise might have caused additional damage to the spillway. The Federal Energy Regulatory Commission (FERC) ordered the California Department of Water Resources (DWR) to assemble a team of five independent experts to assess the dam and issue recommendations. On February 17, 2017, the DWR commissioned an independent Board of Consultants (BOC) to investigate causes, review and comment on repairs to Oroville Dam. Memoranda (reports) prepared by the BOC are posted at the DWR web site. DWR also assembled an Independent Forensic Team (IFT) to determine the cause of the spillways incident, including effects of operations, management, structural design and geological conditions, and the IFT published a nearly 600 page report in January 2018.. The DWR also requested full-time FERC staff to provide immediate oversight, review, and approval of repair plans that would make the dam safe for the 2017–18 flood season. The DWR has prepared a Lake Oroville 2017/2018 Flood Control Season Operations Plan. On May 11, 2017, a hearing took place. ^ a b c d e "Oroville Facilities (FERC Project No. 2100)" (PDF). California Department of Water Resources. January 2005. Retrieved February 13, 2017. ^ a b c d Guerra, Christine (February 14, 2017). "The government was warned that the Oroville Dam emergency spillway was unsafe. It didn't listen". Washington Post. Retrieved February 23, 2017. 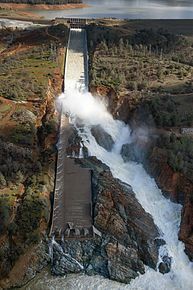 ^ "Alphabetical List of California Dams (Over 40,000 acre feet)". Civil and Environmental Engineering. University of California Davis. Archived from the original on February 5, 2012. Retrieved March 31, 2012. ^ Boxall, Bettina; McGreevy, Patrick (February 12, 2017). "Thanks to storm runoff, there's a lot of water over California's second-largest reservoir". Los Angeles Times. ISSN 0458-3035. Retrieved September 10, 2017. ^ a b "Hyatt Powerplant". California Department of Water Resources. Archived from the original on April 7, 2012. Retrieved February 13, 2017. ^ "Largest California reservoirs releasing water for flood safety". sacbee. Retrieved February 18, 2017. ^ a b Sabalow, Ryan; Furillo, Andy (February 15, 2017). "Oroville Dam's flood-control manual hasn't been updated for half a century". Sacraento Bee. Retrieved February 23, 2017. ^ a b c d Stork, Ronald; Eberhart, Allan; Rainey, Jason (October 17, 2005). "Motion to Intervene of Friends of the River, Sierra Club, South Yuba River Citizens League" (PDF). Archived (PDF) from the original on February 18, 2017. Retrieved February 23, 2017. ^ "Oroville Dam Manual Last Updated in 1970". U.S. News and World Report. Associated Press. February 16, 2017. Retrieved February 23, 2017. ^ "Image: Flood Control Outlet Rating Curve". reddit. Retrieved November 13, 2017. ^ a b c d Plumer, Brad (February 13, 2017). "The Crisis at Oroville Dam, Explained". Vox. ^ a b c d Rogers, Paul (February 12, 2017). "Oroville Dam: Feds and state officials ignored warnings 12 years ago". The Mercury News. Retrieved February 23, 2017. ^ Pritchard, Justin; Knickmeyer, Ellen (February 15, 2017). "Cracks may offer clues to California dam's troubles". Associated Press. Retrieved March 1, 2017. ^ Graff, Amy (February 10, 2017). "Gaping hole in Oroville Dam spillway is growing, officials warn". SFGate. Retrieved February 10, 2017. ^ a b c d e f g h i j "Lake Oroville Spillway Incident: Timeline of Major Events February 4–25" (PDF). California Department of Water Resources. February 27, 2017. Retrieved March 1, 2017. ^ a b c Kasler, Dale; Sabalow, Ryan; Reese, Phillip. "Crater in Oroville Dam spillway will continue to grow, officials warn, as reservoir levels climb". Sacramento Bee. Retrieved February 9, 2017. ^ "Sacrificing California spillway may avoid emergency releases". Retrieved February 11, 2017. ^ a b c "Use of untested emergency spillway yet again a possibility at crippled Oroville Dam". Sacramento Bee. Retrieved February 12, 2017. ^ CA DWR (February 10, 2017). 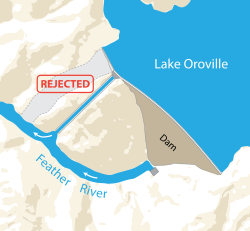 "Lake Oroville Releases Slowed to Avoid Erosion" (PDF). Archived from the original (PDF) on February 13, 2017. Retrieved February 12, 2017. ^ "In Historic First, Lake Oroville Flows Over Dam's Emergency Spillway". KQED News. February 11, 2017. Archived from the original on February 10, 2017. Retrieved February 11, 2017. ^ Associated Press (February 10, 2017). "The Latest: Emergency Spillway Use Likely at Oroville Dam". ABC News. Retrieved February 10, 2017. 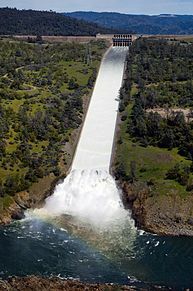 ^ "Water flowing out of Lake Oroville emergency spillway". SF Gate. February 12, 2017. Retrieved February 12, 2017. ^ @CA_DWR (February 12, 2017). "Flows down the emergency spillway peaked last night at 1 a.m. at 12,600 cfs. Lake elevation levels are trending down. @CALFIRE_ButteCo" (Tweet) – via Twitter. ^ Staff, KCRA (February 13, 2017). "Thousands from Yuba, Butte, Sutter counties evacuated". KCRA. Retrieved February 13, 2017. ^ a b c Reese, Phillip; Sabalow, Ryan (February 12, 2017). "Experts: State left with few options while trying to avert disaster at Oroville Dam". Sacramento Bee. ^ "BREAKING: Fearing collapse of emergency spillway at Oroville Dam, Oroville evacuated". Sacramento Bee. February 12, 2017. Retrieved February 12, 2017. ^ a b "Tons Of Rocks Bolster Failing Oroville Dam Spillway". CBS Bay Area. February 13, 2017. Retrieved February 13, 2017. ^ "Updates: New storms approach, but officials confident Oroville Dam and spillways will hold up". Los Angeles Times. ISSN 0458-3035. Retrieved February 17, 2017. ^ Schmidt, Samantha and Hawkins, Dave (February 13, 2017). "'NOT a drill': 188,000 evacuated, emergency declared, as Calif's massive Oroville Dam threatens floods". Washington Post. Retrieved February 13, 2017. ^ "Sheriff Allows Oroville Dam Evacuees To Go Home". CBS SF Bay Area. February 14, 2017. ^ "Fish evacuated from Feather River Hatchery". KRCR. February 11, 2017. Retrieved February 13, 2017. ^ "The Latest: California lake damage may near $100 million". NewsOK.com. February 10, 2017. Retrieved February 11, 2017. ^ "'Amazing engineering feat' saves millions of fish at Feather River Fish Hatchery". ChicoER. February 11, 2017. Retrieved February 13, 2017. ^ Sabalow, Ryan (February 28, 2017). "Oroville Dam's power plant may be operational by Thursday". Sacramento Bee. Retrieved February 28, 2017. ^ Fimrite, Peter (February 28, 2017). "Dramatic new images show scale of damage to Oroville Dam spillway". SFGate. Retrieved February 28, 2017. ^ Sabalow, Ryan (February 26, 2017). "Can Oroville Dam's badly damaged spillway hold up through the rainy season?". Sacramento Bee. Retrieved March 1, 2017. ^ Sabalow, Ryan (February 13, 2017). "Feds order independent review of Oroville Dam spillway problems". Sacramento Bee. Retrieved February 23, 2017. ^ California Department of Water Resources (November 20, 2017). "Oroville Spillways Incident, Board of Consultants". Archived from the original on January 30, 2018. Retrieved January 29, 2018. ^ Board of Consultants (December 20, 2017). "Reports from the Lake Oroville Spillways Recovery Project Board of Consultants". Archived from the original on January 30, 2018. Retrieved January 29, 2018. ^ Independent Forensic Team (January 5, 2018). "Independent Forensic Team Report: Oroville Dam Spillway Incident" (PDF). Retrieved June 14, 2018. ^ a b Ingram, Elizabeth (February 22, 2017). "California DWR selects independent board of consultants to investigate Oroville Dam". HydroWorld. Retrieved February 23, 2017. ^ DWR (October 16, 2017). "Lake Oroville 2017/2018 Flood Control Season Operations Plan" (PDF). Retrieved January 30, 2018. This page was last edited on 31 March 2019, at 23:14 (UTC).